Wayne Rooney has apologised for his remark to TV cameras after Manchester United's defeat by Chelsea that led to a Football Association warning. United's England striker appeared to imply referee Martin Atkinson was biased in favour of the Blues during Chelsea's 1-0 victory on 8 November. When leaving the Stamford Bridge pitch at full-time, Rooney mouthed the words "12 men" at a TV camera. "I probably should not have said it," said Rooney. "I was disappointed at the end of the game and felt we deserved more out of it. Your emotions are high at the end." Atkinson had earlier booked Rooney for protesting about Chelsea's winner. "I felt we didn't get the decisions but that is the way it goes," Rooney added. "It was probably our best performance of the season but it was a disappointing result." Rooney was given a warning about his future conduct by the FA on 9 November but United boss Sir Alex Ferguson did not face any disciplinary action, despite being highly critical of Atkinson's decisions. Ferguson felt the free-kick from which John Terry scored should not have been awarded, and also felt Wes Brown was fouled as it went in. 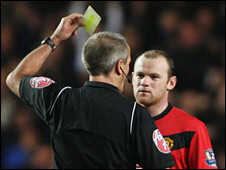 "You lose faith in refereeing, that's the way the players see it," Ferguson said after the match. "The referee's position to make the decision [for the goal] was absolutely ridiculous. He can't see anything. It was a bad decision." Atkinson awarded a foul when Darren Fletcher challenged Ashley Cole outside the box late on at Stamford Bridge, prompting protests from the United players, who felt the Scot had got the ball. Ferguson also felt Didier Drogba pulled Brown's shirt as Terry's glanced header flew into the corner.